stories about movies i've seen starting from 2010. mostly spoilers. loose accounts of actual movie dialogue and plots. 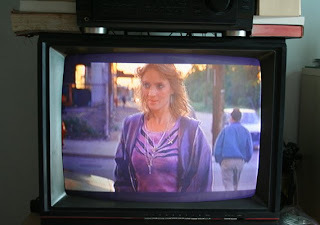 The movie is a fiction made by mostly outsiders to a very specific time and location – working class New Jersey in the 80s. It is about two women who live in houses, go to work, and then, every night, go to the same bar – Olly’s. Olly’s seems to be the only place for them that holds any promise of change or validation. That they do this every night is not boring. You can see them shivering with discomfort and excitement at every evening’s arrival – leaving the warm, beautiful dusk outside and opening Olly’s door towards possibility. It made me think of what that is for other people – this one location of fear and potential, how specific and limited the structures can be that end up becoming the sole place where we look to for life’s potential. The perspective of the movie doesn’t make fun of the women too much and life’s ecstasy and pain are pretty wonderfully full within their restricted stage, a pleasure to watch. Though throughout the movie, the many bridges and train tracks in the background - never crossed over or discussed by the two characters (but heavily paid attention to by the camera) - loom large like slightly condescending angels around them. This made me think of Agnes Varda’s “The Beaches of Agnes”, a movie she made in 2008 about making movies. In one scene she stands in front of a house in a dense neighborhood where she had lived as a young woman. Now she is an older woman in front of the camera holding a giant blue electrical chord on a big spool. She explains that the chord is 300 meters long – and that the only source for electricity that she could use for filming was in her house. She explains that the film she wanted to make had to be shot within a 300 meter radius around her house or else the crew wouldn’t be able to plug their equipment in. An early lesson for and from one of the reigning geniuses in contemporary documentaries/fiction: sometimes one’s own limitations are more interesting than other people’s. "It made me think of what that is for other people – this one location of fear and potential, how specific and limited the structures can be that end up becoming the sole place where we look to for life’s potential." I am always scared of how small we make our worlds, but the way you put it makes it seem okay and primal.